Tombland is a bold concept crippled by its subject matter. That being said, if history is your thing, wade into the mire, my love. Good lord, that was a struggle. The initial response to finishing Tombland, not really digesting the thing but simply finishing it, is that you’ve accomplished something grand. I can only imagine what CJ Sansom felt – accomplishment-wise – upon finishing the actual physical literary construction of this beast, which at 800 pages (plus a 54-page historical context essay) is a marvel in itself. I get these things sent to me, and the goal from this POV is to get them read inside of 10 days. A book which pushes 850+ pages in total is also pushing the friendship, demanding at least 85 pages’ worth of investment per day. Tombland, for all its merits, is probably something that needs to be taken in over a period of months. Maybe longer. But once the dust has settled, and the tangible relief of finishing the thing sets in, it turns out that Tombland is a book which screams for the most part, “Get to the point!”. It is clearly a novel steeped in vigorous, almost messianic levels of research and determination of being beholden to historical letter. But what’s inevitably, and immeasurably frustrating about the piece is that for all its sprawling detail, and for all its theoretical, supposed, presumably historical accuracy, there is enough dramatic and narrative heft and weight to the piece to fill a book perhaps one third its size. He looked deeply into topography and then-relevant slang terms. But for all the descriptions of 16th century pottage, I’d have preferred he got on with the task at hand – storytelling. 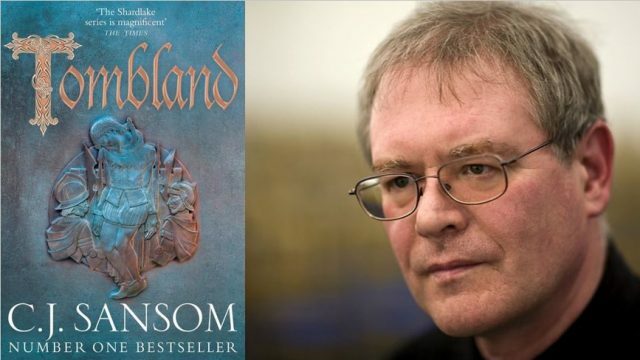 What Tombland has going for it is its place in literary ingenuity, in that it places its protagonist, Shardlake, at the centre of a murder mystery amid historic facts, places and individuals. Sansom has a bit of a tricky path to navigate in this regard, as criminal proceedings and matters of law have doubtlessly changed in the past five centuries. But Sansom’s Shardlake (this is the seventh in this series; the first, Dissolution, having been published in 2003) fits into the narrative as something of an everyman – in as much an everyman can be an ageing hunchbacked lawyer working for the then-princess Elizabeth (later to become Elizabeth I). In this book, he’s investigating the murder of Edith Boelyn, of the “I’m no longer sporting a head atop my neck” Boelyns. Amid the investigation, a peasant revolution takes hold (it’s 1549). There’s a lot of viscera in the ensuing scores of chapters. There’s in all likelihood a wealth of praise to be lavished upon the work, and the stellar work of its author. There’s considerable depth to the characterisations, and a book of this size has to, by its very nature, require detail – bulks of it are encompassed here. Small things jump off the page – such as Shardlake’s reflections on the mighty spire of St Paul’s cathedral – which, of course, is not a thing any longer, but given historical context it makes some sense. At other times, Sansom’s research comes out in the page, but registers as little more than just that – research. Yes, he looked deeply into such things as topography and then-relevant slang terms. But it’s window dressing, and for all the descriptions of 16th century pottage, I’d have preferred he got on with the task at hand – storytelling. If you’re a fan of history, get on board. If you want your soon-to-be summer reading to be on the lighter side, Tombland is literally not going to fit the bill. The Lesser Column covers a broad spectrum of content. With a focus on film, we also publish reviews of music, books, TV shows, live theatre and stand-up comedy, as well as occasional pieces of social and cultural commentary. Our reviews don’t give star ratings or ‘thumbs up/down’, and come from a more personal perspective – why what’s on display affected us in the way it did; why it’s good or otherwise, how it fits in a broader cultural context. Here is where you come for informed opinion and analysis. People are often very selective about how and where they find themselves entertained, so we’re offering reasons why you should see, read, hear, and experience something beyond simply what it’s about.